A home for your instax photos that makes reminiscing and sharing photos a flipping breeze. “EPD is a full-year immersive experience in creative entrepreneurship and product development at the University of Illinois at Chicago.” We are asked to design and develop a product for the market we have explored and connected then launch it on Kickstarter. I love taking instax photos. It is my way to record the special moments I spend with my family and friends. I have tried to store the photos in many places; on my desk, on the wall, or even on a string. I found these kinds of display take away the connection between me and my photos. For that reason, I want to design a product that not only allows you to display your photos in a stylish way, but also allows you to interact with the memories you have created. To do that, I did some market research on some major e-Commerce websites, as well as some interviews and surveys within some Facebook groups and Instagram accounts of instax users. After got the general information and some different insights, I did some hands-on model making with clay and some CAD models, along with the material exploration. You can place Inrolo anywhere you want. As a decorative addition, Inrolo is designed to fit in different living styles with urban decor. It has a universal form that can be customized to your lifestyle by choosing various colors and finishes. Since they are handmade, every product will have a special distinctness. This is a limited edition product as well. Inspired by the iconic rolodex, I invented this clip mechanism allowing you to choose which photo you would like to display at any time. This mechanism easily allows you to change out your photos, storing 10 images at a time. Saving the extra time from framing or storing your photos in an album, Inrolo allows you to change the photos by attaching and detaching in few seconds. Instead of letting your photos collect dust, Inrolo gives you the opportunity to share memories with friends and family by continuously flipping through your instax photos. 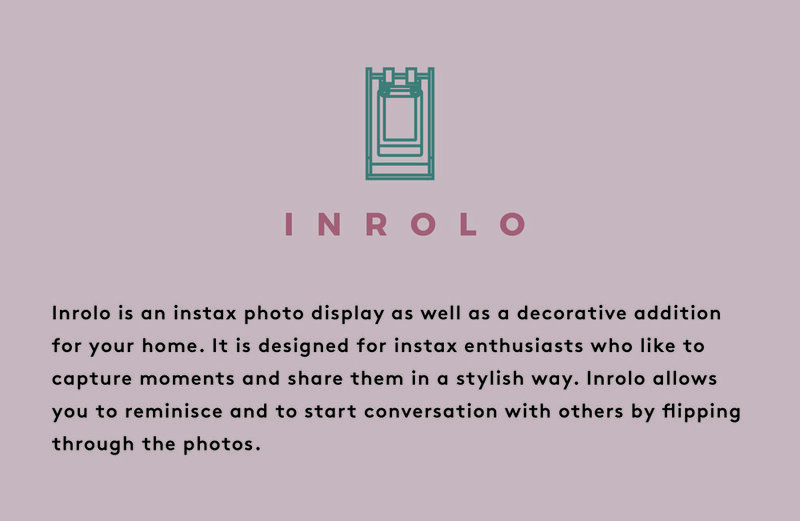 Take a break from digital photo sharing and make analog trendy with Inrolo. EPD class held a launch party on Feb 1, 2018 for us to launch and promote our campaigns at Lost Art. We were able to talk and introduce our product to our guests. After the 3rd day Inrolo got launched, it was successfully funded. It later got featured during ICFF in NYC.